This is the first in a series ofthree articles. The focus here is on needs assessment. The second will deal with establishment, and the final will cover management after establishment. Each facet is as important as the others. All three require thorough attention for the best results. Original climax veld has been given definition over thousands of years by the influence altitude, latitude, continental positioning and other such geographical features. Utilisation by herbivores that evolved in harmony with the vegetation reflects in sustainability. Then seasonal and cyclical features, such as temperatures, rainfall, lightning and large herbivore migrations in more recent times would also havehad their effect. Finally, within any individual property the different aspects, slopes, variation in geology, soils and drainage will have exerted powerful localised influence resulting in unique climax veld with high species richness, but with patchy dominance. 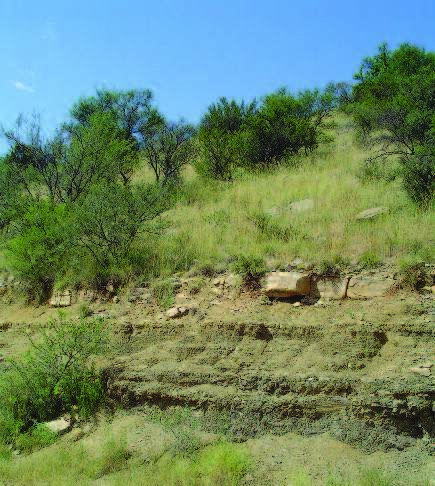 The current problem Deterioration in the veld due to both overgrazing and underutilisation and the side effects of road and dam building, property development and other human interventions have disturbed the original composition of the vegetation. Plant communities have deteriorated in terms of biodiversity and sustainable productivity. These problems need to be solved. An important aspect of the solution of the problems is to take note of the causes. If enhanced production over what climax veld of a particular piece of land would have given is the target, most of these considerations are necessary, plus a lot more. Needs assessment Just how good and how bad is the veld? Does the veld need to be reclaimed or does it require reenforcement? Will there be fertilisation or irrigation? Eroded areas, disturbed soil, old roads and similar bare patches are obvious candidates for reclamation. Areas that are poor due to unfavourable soil conditions are more difficult to decide on. Often, poor grazing is a reflection of soil conditions, such as shallow, stony or sandy soils, which one has to live with. The grass already growing there may be as good as could be expected. Read the signs. Man-made excavations, such as road cuttings, and natural exposures of soil, such as erosion channels and burrows, will reveal valuable insight. Where conditions appear to be favourable and yet the veld is poor, careful observation and reading of the signs will go a long way toward revealing needs. Consider veld in the vicinity of a problem area that for one reason or another is out of reach for grazing. Much can be learned from such areas about grasses that may be growing in a heavily grazed problem area in which they are difficult to identify. Production potential may also be suggested. However, observations should be tempered by the fact that species composition will shift over time due to grazing difference and similar factors, such as cutting and fire. Fallen thorn trees and large, broken thorn branches keep grazers away sufficiently for underlying grasses to develop fully and flower. Grasses at that stage of growth are easier to identify. Patches like these are especially informative as they will have been similar to the surrounding veld with the same grazing intensity immediately before being covered. Increaser species of grasses are very helpful in identifying grazing problems. Increaser I species will point to underutilisation. Typical of these are thatching grasses Hyparrhenia species and turpentine grasses. Cymbopogon species. Their presence could mean that there are not enough grazing animals. It could also mean that there is too much selective grazing, probably due to grazing intensity being too low. While these are very different problems the indicator I grasses will narrow down the range of possibilities to be investigated. Increaser II species are indicators of overgrazing in drier areas. Many of the three-awn grasses or steekgrasse Aristida spp are typical and particularly useful, as they are well known and easy to identify. Careful note should be taken of the places in which these Aristida grasses are found. If the soil is poor in the actual spots where they are found, that could be the reason for their presence. Be careful not to jump to conclusions. Increaser III species indicate overgrazing in higher rainfall areas. Wire grass or koperdraad Elionurus muticus is typical and easy to recognise. The scarcity or absence of certain desirable grasses that are termed ‘decreaser species’ will also help in diagnosing grazing problems. Famous in this context is red grass or rooigras Themeda triandra that one would expect to find in well-grazed veld throughout South Africa except in the very arid far western parts. Bush encroachment is favoured by overgrazing. The early stages are a valuable warning against too much grazing. species that will not become a nuisance should they persist. Biomosome®Reclamation veld seed mixtures are blends of this nature, and will speed up the process of plant succession. The ingredients are pioneer and sub-climax species and nearly all are grasses. There are five blends, each one comprised of species suited to the biomes for which they are intended. Priority in increasing production for wildlife grazing is to select areas with potential. If an area is to be ploughed there will be an opportunity to correct serious fertility problems and imbalances with ameliorating fertilisers that would be difficult if not impossible otherwise. Cultivation of the entire area will also make fertilisation for direct benefit to the new pasture a lot more efficient. However, interseeding of existing veld is also possible and may be imperative if there are too many trees and rocks in the way. Soil analysis should be done to determine the ameliorating fertilizer and shorter-term nutrients for the enhanced grazing that is necessary. The characteristics of a blend intended for higher production for wildlife are the same as for reclamation except that species that respond well to fertilisation, irrigation or both should predominate. They should not give way to other species while these treatments continue. These are typically subclimax grasses of which Biomosome® Wildlife veld seed mixtures are composed. Newly planted grass attracts game. Planting all at one time will reduce the concentration of grazing and the consequent risk of damage. If it is possible to prepare the soil and plant as one would a cultivated land, areas like these can often be at least partially protected by fencing. This is a great advantage in the first season. If not, the bigger the area relative to the number of animals the better. Where strip planting is done it is seldom possible to exclude animals. This situation calls for brush packing along the strips to protect the plants until they are established. Once established, a seeded area should be managed with due regard for the problems that were detected during needs assessment and care should be taken not to repeat mistakes of the past.